1. heavy duty 4 shelf storage rack. 2. Storage rack with lots of plastic slide in bins. 3. Dresser: old but fine. It's all going to you, goodwill, or the landfill by next Friday. Free to CBKC members. If you don't like free you may send Smokestacks to me in NY. My wife and I just moved into a new house and we are about to host a birthday party for her mom in a few weeks. That said, some of the stuff on your list sound like they will fit our needs. heavy duty 4 shelf storage rack. Storage rack with lots of plastic slide in bins. We might even have interest in the small bookshelf and bedside drawer depending on size. We'd be confined to a minivan to move anything. Let me know if any of this is till up for grabs and what times/day work for you! Someone has dibs on the racks. The other stuff is yours. The bookshelf is an IKEA billy. Pretty small and you might be able to break it down easy anyway. 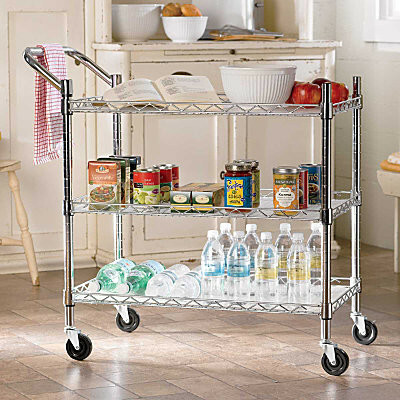 After seeing my apartment in NYC and making a sober assessment of it's size I am now also looking to liquidate a rolling kitchen cart. It is about 18 inches deep and about 3-4 feet wide. Wire construction with a butcher block top. Very similar to this except the handle is smaller and with the wood insert in the top. i'm holding out for frozen food. thomas15 wrote: i'm holding out for frozen food. I've managed that well. I'll eat it all. Where did you find a place? to Park Slope. A couple blocks from 4th Ave Pub and Pacific Standard which I think you've rated. I'll also throw out that I till have a dresser not spoken for and two plastic folding tables. All free but Thursday morning is pretty much drop dead on getting this stuff out unless I have a very solid commitment to get something Friday. also, you accepting floor sleeping visitors ever? in a couple months? johnf wrote: I'll also throw out that I till have a dresser not spoken for and two plastic folding tables. All free but Thursday morning is pretty much drop dead on getting this stuff out unless I have a very solid commitment to get something Friday. Do you know approximate lengths/heights of the folding tables?